Thom Conboy at BYS (formerly Burger Yacht Sales) tells me he's now joint central agent with Edmiston on the 39m motor yacht SnowbirD with a €2 million price drop. Built to a design by Cor D Rover, the yacht’s striking contemporary interior was designed by Michaela Reverberi. She accommodates 10 guests in a main deck full beam master suite, two doubles and two twins. Lloyds classed and MCA compliant, SnowbirD has a range of 5,500 nautical miles at nine knots and is powered by twin 600hp Caterpillar diesels to a maximum speed of 13 knots. 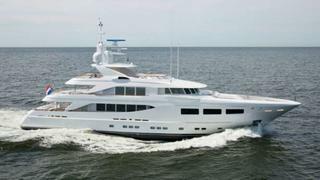 A finalist in the 2012 World Superyacht Awards, SnowbirD is now asking €17.9 million.